Quite a change for fat with the change in the purple segment size and now a focus on unsaturated fats. It would have been nice to have a larger range of these fats, however they often cross over into other food groups so it can be a little confusing. Other foods include: avocado (also a veggie), nuts, seeds and oily fish (also a protein), olives (also a veggie), olive oil. Hooray for more of a focus on fibre! With all the sugar madness that has been flying around, fibre has had to take a backseat. It is good to see the wholegrain message being highlighted. Recommendations are that we eat 30g of fibre a day, which is a lot. Eat wholegrain foods at meals, snack on fruit and veg and include 2 high fibre snacks (homemade flapjack with seeds in would be one of mine) and you will just make it. The segment sizes have very much been revisited. Linear modelling (which I am not an expert on) was used to look at the guidelines and compare this to what the population currently eats. 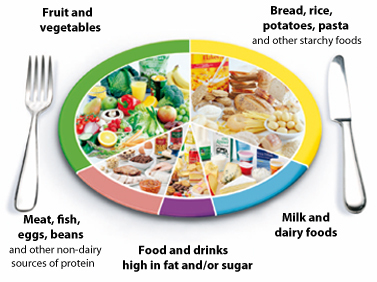 We have this data from the NDNS – regular dietary surveys that are carried out on the UK population. So what we have is an achievable version of the guidance, rather than the “perfect diet”. 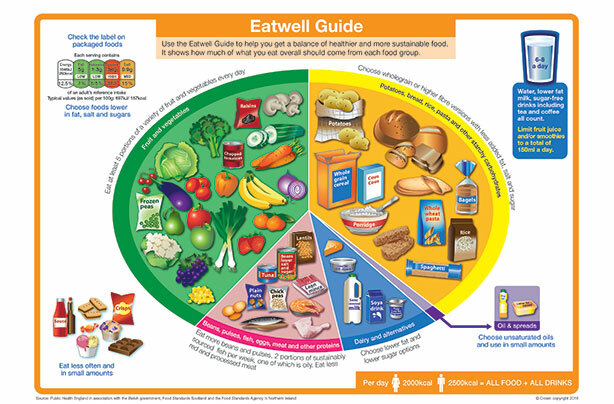 I like this, as a dietitian it is how I work, translating the science and guidelines into achievable bite size pieces of advice. The inclusion of a drink is a positive step towards helping education people on sensible choices of fluids to drink. It was also a change to make a change to the advice on fruit juice and smoothies, so you can see that now a smoothie will only count as 1 portion of your fruit and veggies a day. That’s 1 portion total, so if you drink 5 smoothies a day that is still only 1 portion of fruit and veggies…..and a lot of sugar. This has the aim of helping us reduce sugar intakes in light of dental health. Other changes are there being less red meat and processed meat on the plate. So the 70g of red meat per day guidance has been integrated in. Drawn foods have been used after focus groups consulted on the images. I’m not so much a fan of this. To me the model looks very simplistic but perhaps that is what we need? A return to basics and simple, sensible advice? Do you like the new model? Does it help you think about how to eat healthily?